It is our commitment to not take any shortcuts in the food preparation process. We do not use canned products. All food is prepared from scratch using fresh & quality ingredients. We even bake our own bread. If we don't make it, we don't sell it! Alcazar will cater and deliver it's award winning food for any occasion. Whether it's a business lunch, a casual dinner at home or an event. We also offer curbside delivery for your convenience. Please feel free to give us a call anytime at (818)789-0991. Serving L.A. for 13 plus years. 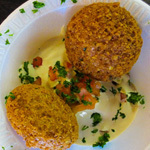 Alcazar has been serving Los Angeles with high quality Mediterranean food for thirteen years. 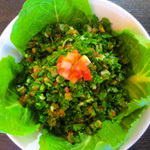 During its 13 year tenure, Alcazar has been featured twice in 2008 & 2009, by Pulitzer winning food critic Jonathan Gold’s L.A.’s 100 best & 30 best restaurants, & is the only Mediterranean/Lebanese Restaurant in the U.S. rated by MICHELIN in 2009, as well as ZAGAT in 2012 & 2013. Not to be forgotten, Alcazar’s Hummus was rated #1 in a 30 restaurant survey by the Los Angeles Times, in a Sept. 2006 issue. Alcazar is already setting the trend with it's new location in the heart of Sherman Oaks. Please come in today and experience it for yourselves. The freshness of our no shortcut approach, with the quality of a fine dining experience and finally with the speed of any fast food establishment. We guarantee it! IF WE DON'T MAKE IT, WE DON'T SELL IT! Finely chopped italian parsley, fresh mint, tomato and scallion, mixed with a hint of fine cracked wheat, fresh lemon juice,extra virgin olive oil and spices. 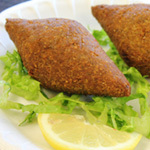 A blend of ground beef and cracked wheat filled with ground beef,onions,pine nuts & spices. Ground Garbanzo & Fava Beans mixed with our blend of spices then deep fried. 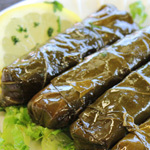 Grape leaves stuffed with a savory mix of rice,vegetables and spices. 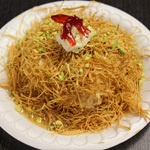 Baked crispy thin shredded dough, filled with Ashta, topped with sugar syrup & pistachio. 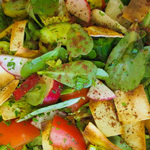 Romaine lettuce, cucumber, tomato, parsley, baby arugula, radish, fresh mint, purslane(seasonal),bell peppers, topped with toasted pita bread & our special lemon/pomegranate dressing.